Begin your adventure at beautiful Wailea Beach in south Maui. It's an unforgettable experience for the whole family! 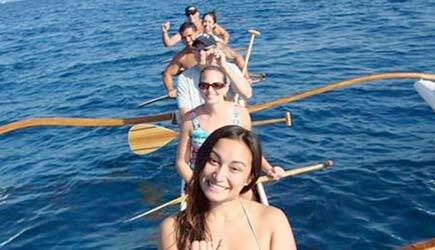 On the traditional Outrigger Canoe Tour, learn a part of Hawaiian History! Spend the day swimming with honu or watch as they cruise next to the canoe! Snorkel and discover the ocean's creatures and treasures. Cruise around the turquoise waters in one of their stand up paddle boards. In the winter, keep your eyes peeled for the majestic humpback whales! Look around to views of Haleakala,Lana'i, Kaho'olawe, and Molokini. 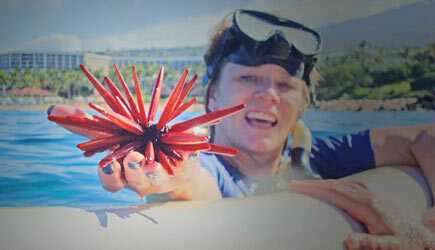 With Wailea Beach Activities you will enjoy premier ocean and cultural experiences. Your adventure departs beautiful Wailea Beach in south Maui. Wailea in ancient Hawaiian translates to ”Waters of Sacred Happiness”. On the traditional Outrigger Canoe Tour, learn a part of Hawaiian History and the illegal occupation of Hawaii and overthrow of the Hawaiian Monarchy in 1893 as you walk in the footsteps of the Ali’i (Chief, Royalty). Learn about the Polynesian Voyagers as they sailed the Polynesian Triangle (New Zealand to Rapa Nui to Hawaii) using Celestial navigation/wayfinding. Take in the breathtaking views of Haleakala, West Maui Moutains, Lana’i, Kaho’olawe/Kanaloa, and Molokini. 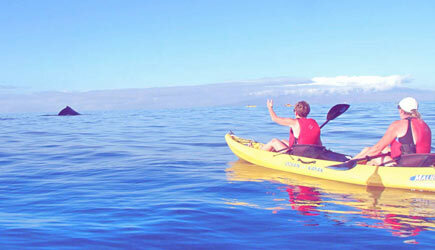 Paddle the canoe to Turtletown off Wailea Point and see the honu and honu’ea (Hawaiian Green Sea & Hawksbill Turtles)! You can swim with the turtles or watch as they cruise next to the canoe! Hawaiian Outriggers are known for their long, angular build, and is one of the most recognizable sights of Hawaii's shores. They were originally used for fishing, war, travel, and commerce. 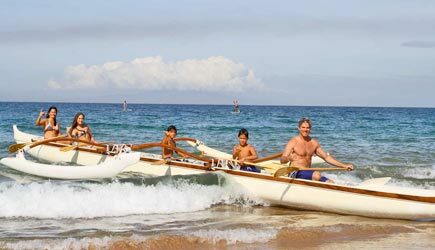 Outriggers have shaped the very trajectory of Hawaiian culture, and the shores of Maui are home to some of the world's best professional and amateur canoe clubs. 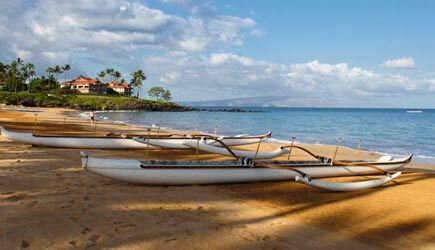 Participate in traditional Hawaiian Chants (oli) as you paddle in their canoe (hoe wa’a) along the south coast of Maui. Oli is one of Hawaiian's oldest tradition, and is a combination of oral history, poetry, and song. Oli was originally intended as a means to pass knowledge down through generations, and these songs are the core of our culture. These chants are shared with you during your time on the water. 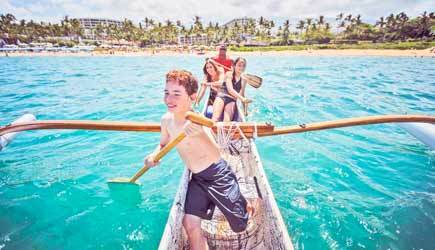 Spend the day at Wailea Beach and have an unforgettable experience for the whole family! Ultimate Beach Package - BEST VALUE! Wailea Beach Activities is available either day in port with a cab ride of 30 minutes each way or we can arrange a rental car. No Maui vacation is complete without at least one good beach day. Why not make the most of this opportunity by getting out on the water in a traditional Hawaiian outrigger canoe? All the other beach goers lying in the sand will be amazed (and a little jealous) when you walk past them to hop inside the main hull of a watercraft invented by ancient Hawaiians! Your guide handles the hard part of navigating the surf, and you assist by paddling when you are told to paddle. This event is great for families or groups of friends since the canoe seats up to six. Oh, and as your canoe casts off, be sure to wave goodbye to all those people lying in the sand! Haha - too bad they didn't research these things like you did! Just a short paddle away is a famous destination called "Turtle Town." Once people get OUT on the water, most of them want to get IN, so we recommend the 90 minute outrigger tour with snorkeling. After taking in the island and ocean scenery above the surface, you'll jump in for a refreshing underwater view as you snorkel around beautiful coral reef, colorful tropical fish, and the resident population of Hawaiian green sea turtles (locals call them HONU). 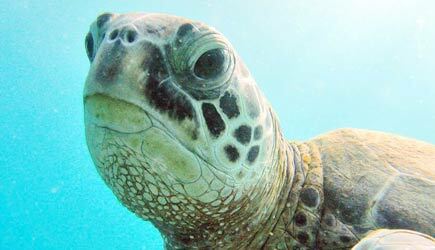 If you are lucky you may even see a "turtle cleaning station" where the reef fish line up to munch on algae that grows on honu shells. And during whale season (December through April) you are likely to hear whales singing in the distance as their voice carries for miles underwater! If you want to paddle but prefer a smaller vessel all to yourself, then the sit-on-top double ocean kayaks are another option, and great for couples. Again, we recommend that you do the longer version that includes the turtle snorkeling. It takes a little longer to get to and from Turtle Town by kayak (compared to the sleek outrigger canoe) so the kayak version of this tour is 2 hours long instead of 90 minutes. The Ultimate Beach Package is the perfect option for those that want to have a beach day and not have to worry about getting to a snorkel shop somewhere to rent all of your gear – It's all provided, and set up for you! The Ultimate Beach Package includes everything you would need for the day – boogie boards, snorkel gear, SUP board, even the beach chairs and umbrellas! You just show up with your towel and have fun! No gear lugging required! These activities are all offered on Wailea Beach which makes it most convenient for those saying in Kihei, Wailea or Central Maui. Those that are staying on the Lahaina side of the island and want to check out what the Wailea side has to offer can make the hour drive. Again, since everything is set up for you, it makes it super easy.